This website has been created, and is often updated and monitored by students and staff of a learning institution located in New Jersey. Due to the fact that students have access to post links and information (although reviewed, some material gets by us), we ask that if any content has been used without copyright permission that the owner of the content contact us via one of our contact us submission points on our About Us page to have it removed. This website has been created as a resource to anyone interested in the ocean and coral reef systems. This website generates no income at all for the owner, we don't get paid for clicks or for anything associated with our free site. We provide information and links for everyone to enjoy and hopefully if we promote one of your videos you do make some money, if that's your thing. We do accept donations to help us run studies in the classroom, mainly out of pocket expenses associated with laboratories or class trip costs that go above the allotted funds, maintenance of this website, and creation of promotional/learning materials. Learn more about donating at our About Us page. Help Save The Reef is a website dedicated preserving the natural coral reefs through education and captive breeding and aquaculture of corals and invertebrate. Our mission is to provide the best information compiled from various sources throughout the hobby, personal experiences, and input from our users. Included are instructions on coral fragging and propagation, current threatened species lists and breeding programs that require your help in preservation of species. Between 1.5 and 2 million people worldwide keep marine aquariums, including 800,000 households in the United States alone. 1,471 species of fish are traded worldwide, with global trade ranging between 20 and 24 million individual fish annually. 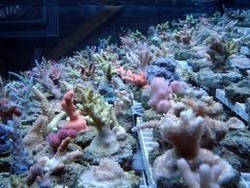 Fewer than 10% of marine ornamental aquarium species are currently captive-bred. Link to BBC article titled, How can we save our dying coral reefs? "Hawaii's Department of Natural Resources came up with a white list on species acceptable for removal from Hawaii reefs. The problem is conflict of interest and corruption: the Natural Resources Director is a longtime aquarium collector who drafted the white list with his friends in the aquarium trade to sustain 98% of reef extraction revenue in Hawaii. The white list is a sham list, including many vanishing species, endemic species, species vital to reef function, all in deference to wildlife trafficking for the pet trade. Reefs around the world are dying. St. Croix and Palau are among those places to ban the aquarium trade. It's time for Hawaii to ban the aquarium trade."